Oh you know, these action movies aren’t meant to have good acting. And really the only good performance in this film is from Aaron Paul. And thank god for that. There’s nothing I hate more, even with an action flick, than a terrible lead. Cheesy? Yes. Corny? Yes. Over-the-top? Absolutely. It’s just what you’d expect from an action movie about illegal street racing! Not bad. A little video-gamey, but that’s to be expected since it’s based off of a video game. Are pleather jackets and turtle necks still a thing? Were they ever a thing? I’m looking at you, Dominic Cooper. 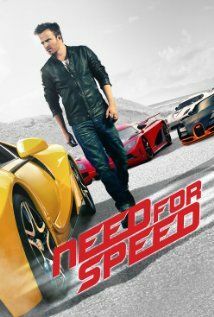 Action racing movies have always been exceptionally cliché and a bit far-fetched. That’s one of the things that makes them so much fun. But this one pushed the dubiousness to a whole other level. And not even really with what the main character was doing, but what one of his cohorts was doing. While Tobey (Aaron Paul) sped down the freeway at felonious speeds to make it from New York to California in 47 hours (let that sink in for a moment); one of his partners-in-crime, Benny (Scott Mescudi), flew overhead in a tiny plane to keep a lookout for any cops. While in the city though, Benny borrows a helicopter to fly around. But then things get really absurd when suddenly Benny comes soaring down from the heavens in a military helicopter (because he has connections with an Army major, obviously). This is no Fast & Furious. The dialogue was really quiet. This wasn’t as fun as other racing movies were. For that, it made it go a little long.